Flash Sale! : 10% off Quilting Cotton : We Need Shelf Space! 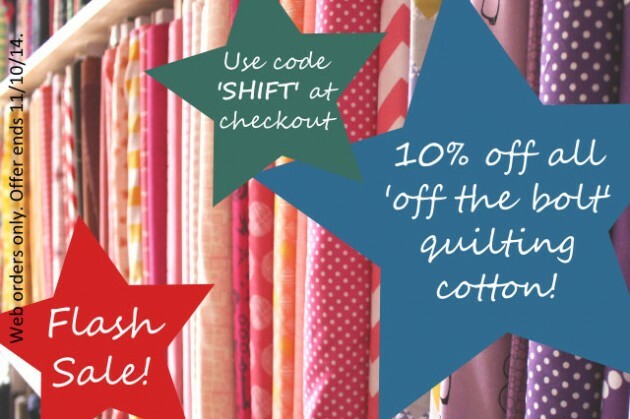 Order online before the end of day on Saturday 11th October and on entering the code SHIFT at checkout we will apply a 10% discount to any off the bolt quilting cotton in your basket. WHY? BECAUSE WE NEED THE SHELF SPACE! We're drowning in quilting cotton here at the Backstitch shop. This week we've had some exciting deliveries with new ranges including Gramercy from Leah Duncan, LOL from Me & My Sister, Pedal Pushers from Lauren & Jessi Jung, more Cotton and Steel, and a massive Sketch restock. The situation is so bad that we have run out of space on our shelves, and the counter and workshop tables have become covered in bolts. Will you help us make some room for them? !